Driven with perfection, Salius Pharma offers a wide range of stretchers that find wide application in hospitals at best prices from India.These stretchers can be easily converted into many other forms like wheel chair, flat bed and more. Backed by expert and experienced professionals, we provide Aluminum Stretcher. 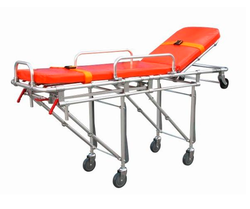 - Net weight of Emergency Ambulance Stretcher: 45kg. - Gross weight of Emergency Ambulance Stretcher: 55kg. 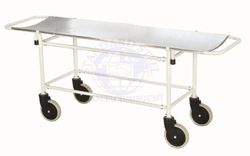 - The Load bearing capacity of Emergency Ambulance Stretcher: 159kg. Ø Approximate Dimensions: 2110L X 560W X 810H mm. Ø Strong 16G MS tubular frame work mounted on four 150 mm dia swiveling castors.